There’s just something special about twin-engine airplanes. Whenever a twin shows up at the flying field, most modelers stop what they’re doing and go over to check it out. Maybe it’s the sound of the engines as they sync into and out of phase while the model is in the air; or perhaps it’s the overall size and proportions of the model with its two or more engines slung under its wings. 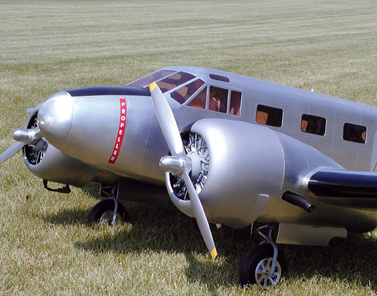 Whatever the reason, twins have been very popular choices for scale modelers, and they continue to draw attention wherever and whenever they fly. Over the years, I have designed and flown several giant-scale twins and very rarely have I had any engine-out problems. My first big twin was my 140-inch-span Douglas DC-3/C-47. At the time, Quadra 35s were the only real choices for gas engines, but I have seen this design flown very nicely with a pair of Enya 1.55 4-stroke glow engines. The next was the 101-inch-span, B-25 Mitchell medium bomber powered by two Zenoah G-23s. The B-25 remains one of my most popular designs, and I have sold about 2,000 sets of plans for it. If I were to build another, I would power it with the new G-26 gas engine. 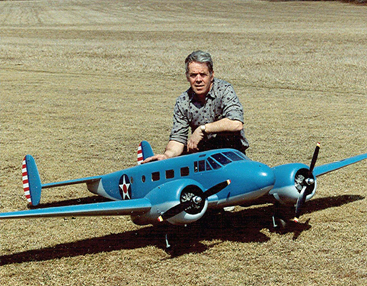 Next was my G-38-powered 114-inch-span Beechcraft D-18, which was followed by my 1/7-scale, 114-inch-span P-61 Black Widow (also powered by G-38s). 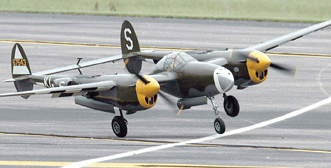 My last twin, the P-38 Lightning, also has a span of 114 inches and was designed around a pair of G-45 engines. With this article, I’ll highlight some of the basic do’s and don’ts for your first twin-engine airplane. (Above) I always use soft mounts such as these from Scale Aviation because they keep the airframe and the engines happy. The most important thing to consider when flying twins is engine reliability. I have hundreds of flights on my P-38 and my Black Widow and have never suffered an engine-out. This is because I take the time to set the engines up properly. 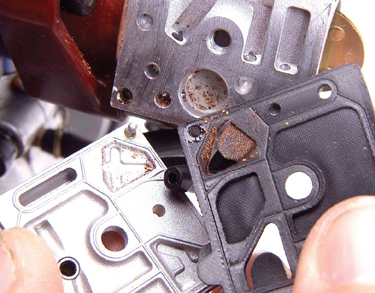 To keep the engines running reliably, you must supply them with clean fuel. I see it all the time at the flying field: an engine quits because the filter screens inside the carb are clogged and fuel flow suffers. I always use two filters in my fuel container, a felt clunk filter and an inline paper filter. Clunk filters backed up with in-line filters between the engines and the model’s fuel tanks are standard equipment on all my models. Clean, well-filtered fuel is also very important for glow-engine aircraft. I use industrial-grade filters that you can buy at most small-engine and lawnmower shops. They are good insurance and should always be used. It is also very important to set both of your engines up so they are absolutely identical in operation. This means you use the same servos and the same clevises and pushrods in their throttle linkages. Make sure you have the linkages installed in the same holes in the servo arms and that both carburetors move the same amount and are linear in response to the movement of the transmitter throttle stick. This may take a little work, but believe me, you can’t control a twin without having identical engine setups. Of course, you want to balance the props properly and make sure the mufflers are the same and are tightened into place properly. It wouldn’t be a bad idea to safety-wire the muffler bolts so there’s no chance of one coming loose. I like to use soft mounts, and I use either the B&B Specialties or the Scale Aviation brand of soft mounts of the size I need for the engine in use. (Above) When setting up a twin, especially a tail-dragger like this D-18 built by Dennis Crooks, be sure to set the engine side thrust properly. If you don’t, the model will torque-turn to the left! When it comes to syncing the engines’ rpm, do not lean the slower engine to increase its speed. This will lead to its over-heating and eventually dying at the worst possible time. Instead, richen the faster one slightly to decrease its rpm. For the most part, with both engines carefully set up, it is more important to have reliable engines than to have their rpm matched exactly. 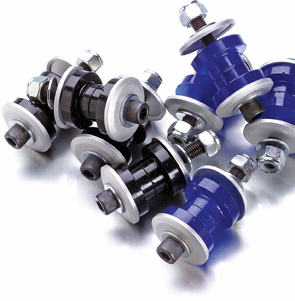 I always use gasoline engines, and in fact, I have only used engines with magneto ignitions. True, a CD ignition offers easy hand starting, a lower idle and probably a little more top-end power. But I prefer the simplicity and reliability of a magneto. If, however, you prefer to use glow engines to power your twin, be sure to completely break the engines in and adjust the carburetors for a reliable idle and a smooth transition through the midrange. It would also be a good idea to use an onboard glow-driver system (one for each engine) to keep the glow plug lit. This will greatly improve engine reliability, especially when set up to come on at and below 1/4 throttle. (Above) The very popular P-38 Lightning is one of my favorite twin-engine designs. I have hundreds of flights on it and have never had an engine out. Its Zenoah G-45 gas engines offer excellent, reliable power. For a tail-dragger aircraft, I set the left engine with zero offset, and I set the right engine with 3 degrees of right thrust. I came to this setup when I was fine-tuning my Beech D-18. The Paul Matt 3-views I used to design the model, showed each engine with 2 degrees of outboard thrust. As it turned out, this produced a tremendous amount of left torque. Even with full right rudder, the D-18 always turned to the left on takeoff. My zero and 3 degrees setup solved the problem nicely. The effect of left torque turning is much less of an issue with aircraft that are equipped with tricycle landing gear. I feel that this offset thrust setup also helps during an engine-out. How much engine down thrust you need is more a matter of how the airplane flies and the model’s wing and tail-surface incidences. You can adjust this after several test flights. 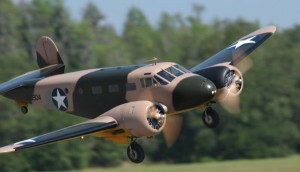 (Above) Here is my first Beechcraft D-18. It flew great, but I lost it after one engine signed off because my electric-powered smoke system was still pumping smoke oil into my mufflers when I pulled the throttles back. 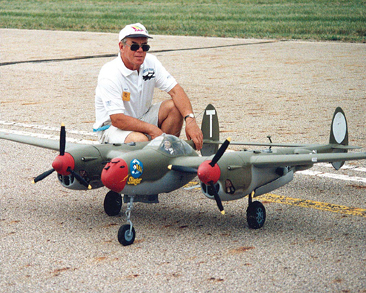 (Above) twins like my P-38 Lightning that are equipped with tricycle landing gear are less likely to torque-turn to the left on takeoff. But having the correct engine side thrust is always very important for proper performance. (Above) my B-25 Mitchell medium bomber remains one of my most popular designs. It has a lot going for it, twin tails, gas engines, tricycle landing gear, almost everyone recognizes it and it has excellent flight characteristics. As a rule, twin-tail airplanes are better for twin engines than single-tail designs. There’s no great secret to successfully flying twins; the important thing is to fly smoothly and not to be heavy-handed with control inputs. 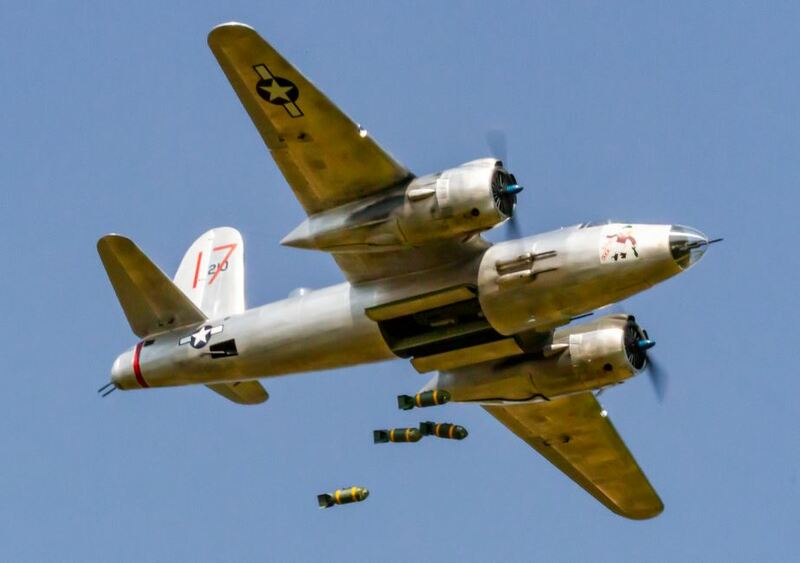 I once saw a really nice C-47 destroyed because its pilot yanked it off the ground on takeoff and tried to fly it away with its nose at close to 40 degrees above the horizon. Of course, one engine sagged and went offline, and the model lost power and airspeed at a very low altitude. Had the pilot flown his model smoothly at a gradual departure angle, the engine may never have quit. Even if an engine does sign off, if you have enough altitude and you maintain airspeed, you can save the model by remembering always to fly it. Advance the throttles smoothly; don’t just jam them full open for takeoff. As long as both engines are running, flying a twin is no different from flying a single-engine aircraft. If you do lose an engine, throttle back slightly and determine which engine is out. Then adjust the rudder trim to compensate for the offset thrust and unwanted yaw, and think about bringing the model in for a landing. Try not to turn sharply into the dead engine, but more important, maintain the proper airspeed while you set up your emergency landing. Most multi-engine models have a higher than normal wing loading. Many twins are lost because the pilot doesn’t keep the wings flying with the proper airspeed. As a rule, twin-tail airplanes are better for twin engines than single-tail designs. This is because the rudders are more effective when positioned in the propwash. Full-scale planes have two rudders for the same reason. If you want a single-tail twin, pick one with a big rudder and fin. If you want to install an electric-pump smoke system (or two), set them up so that they will come on at 1/4 throttle and higher. If they come on at lower than 1/4 throttle, the smoke oil can flood the muffler and cause the engine to die. Believe me, I know; I lost my first D-18 because I did not switch the smoke off before I pulled the throttles back. A simple radio mix can also be used to have the smoke switch tied to the throttle position, so there’s no chance of it switching on when the engines are below 1/4 power. Flying twins is a source of great pleasure and always brings fun to the flying field. If you set your engines up properly and fly your model reasonably, you, too, will enjoy that multi-engine excitement. Big or small, twins are hard to beat! By Nick Ziroli Sr., Photos by Nick Ziroli Sr. & Palmer Johnson. Part of the Model Airplane News “Classic Archive” Collection of Online Articles.